– New Listings increased 3 percent to 14,873. – Pending Sales increased 14.7 percent to 11,772. – Closed Sales were stable, posting a 1 percent increase to 11,256. – Days on Market decreased 9 percent to 50 days. – Median Sales Price increased 4 percent to $208,500. – Average Sales Price increased 4.5 percent to $256,125. – Inventory levels decreased 13 percent to 38,169 units. – Months’ Supply of Inventory was down 20 percent to 3.7 months. Click here to access the full report for July. That’s great news for sellers! For buyers the market is HIGHLY competitive! Whether buying or selling, it is CRUCIAL you have an experienced Realtor® representing you to help you navigate the many twists & turns of a real estate transaction. Of course, you know who to call. 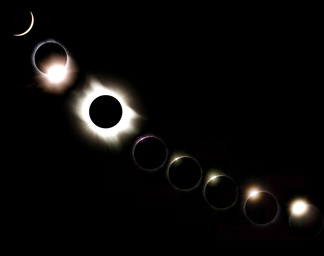 A solar eclipse is a lineup of the Sun, the Moon, and Earth. The Moon, directly between the Sun and Earth, casts a shadow on our planet. If you’re in the dark part of that shadow (the umbra), you’ll see a total eclipse. If you’re in the light part (the penumbra), you’ll see a partial eclipse. Yes, the Sun’s a lot bigger. Our daytime star’s diameter is approximately 400 times larger than that of the Moon. What a coincidence that it also lies roughly 400 times farther away. This means both disks appear to be the same size. First contact is in Oregon. If you want to be the first person to experience totality in the continental U.S., be on the waterfront at Government Point, Oregon, at 10:15:56.5 a.m. PDT. There, the total phase lasts 1 minute, 58.5 seconds. The center line crosses through 10 states. The extreme northeast part of Georgia does experience some totality, but at no point does the center line pass through that state. Cool things are afoot before and after totality. Although the big payoff is the exact lineup of the Sun, the Moon, and your location, keep your eyes open during the partial phases that lead up to and follow it. As you view the beginning through a safe solar filter, the universe will set your mind at ease when you see the Moon take the first notch out of the Sun’s disk. Around the three-quarters mark, you’ll start to notice that shadows are getting sharper. The reason is that the Sun’s disk is shrinking, literally approaching a point, and a smaller light source produces better-defined shadows. At about 85 percent coverage, someone you’re with will see Venus 34° west-northwest of the Sun. If any trees live at your site, you may see their leaves act like pinhole cameras as hundreds of crescent Suns appear in their shadows. The future is bright but long. The next total solar eclipse over the continental U.S. occurs April 8, 2024. Three friends recently found themselves in the position of selling their mom’s house. Two of the friends got pre-maturely excited when they received a letter from the bottom feeders who search obituaries for leads. The letters promised top dollar for the homes. Which is soooo not the case. Case in point, one friend was smart & contacted me after receiving several letters about selling her mom’s house. I sold it for $310,000, without listing. Another friend who got sucked in by the buyer’s reassuring promises sold her mom’s house for $285,000. Here’s the kicker, they are both in the same neighborhood; the one I sold (for $310,000) was a ranch on a slab, the other house was a 2 story with a basement. Obviously there was money left on the table ($35,000+) for the 2 story. The 3rd person sold her mom’s house for at least $30,000 less than what I could have brought her & I had buyers waiting in the wings. PLEASE don’t make this mistake!!! You could be unwittingly costing your family a significant amount of cash & that breaks my heart. If you or someone you know find yourself in the situation of selling mom’s house contact me first before making any decisions. Promise it will be worth it & your family will be very appreciative! Also, as your Real Estate Concierge, I know who to contact to help with everything else associated with selling mom’s house; Estate Sales, Charities that pick up furniture, who to call to haul away the “other” stuff, handymen, probate attorneys, etc. I’m here to help you through what can be a challenging, daunting task (know that from personal experience). So if you or someone you know is trying to figure out what to do with mom’s house contact me TODAY for the answer. The lack of homes available for sale combined with rising prices led to a slower housing market, according to the Atlanta Realtors’ June report. Home sales dropped 2.1 percent compared to last year, from 6,099 in June 2016 to 5,974 in June 2017. This is down 1.8 percent from May’s total of 6,086. However, this is still higher than in June 2015, which saw 5,742 home sales. Inventory fell 4.9 percent year-over-year to 15,498 units. New listings totaled 5,731, which is down 2.0 percent from last year and 2.9 percent from May 2017. However, the month’s supply over a 12-month period increased from 3.1 months in May to 3.2 months in June. The lack of inventory has driven up competition for homes as well as home prices. The average and median sales prices continued to outpace 2016 with median sales prices growing from $250,000 in June 2016 to $267,000 in June 2017, a 6.8 percent increase. Average sales price saw similar gains, rising from $307,000 last year to $327,000, a 6.5 percent increase. On a month-over-month basis, median sales prices grew 3.9 percent, while the average sales price grew 2.2 percent. “The number of year-over-year transactions maintains a pace that tracks with the overall economy and prices continue an even stronger recovery trend as the inventory levels remain at about 3 months, which is tighter than last year and a sign of a healthy local market,” said Atlanta Realtors President Bill Rawlings.